I am inclined towards a solitary life. Even though I have my family and friends around me, they know that this is my preference and therefore let me get on with it. I know they're all there if I need them and when my mind turns to more social occasions, they're there to help me with that as well. Sometimes I go for long periods without seeing some of the people I love and when we catch up, I silently swear to not allow such a time apart to happen again. It always does because I'm a solitary bee. I am what I am. Today I'm going to Maleny. I have a few errands but importantly, I'm having lunch with my friend Patrick. I haven't seen him for more than six months, although we have spoken on the phone a few times. When he lived in Sydney, Patrick worked as a dress designer, then, after moving to Queensland with his partner, he retrained as a chef. Now he's well known for his raw and vegan food. When I worked at the Neighbourhood Centre, Patrick came in to the embroidery classes and wowed us all with his sewing skills. There's not much he can't do but I'll be content to be the recipient of his food later today and I'm sure we'll sit together for a couple of hours, looking out over the rolling hills, talking about all sorts of craziness. Everything is good here at home. I'm on the fifth day of my new ginger beer plant. It started fermenting on the second day and is going strong. I'll probably make it up on the weekend. 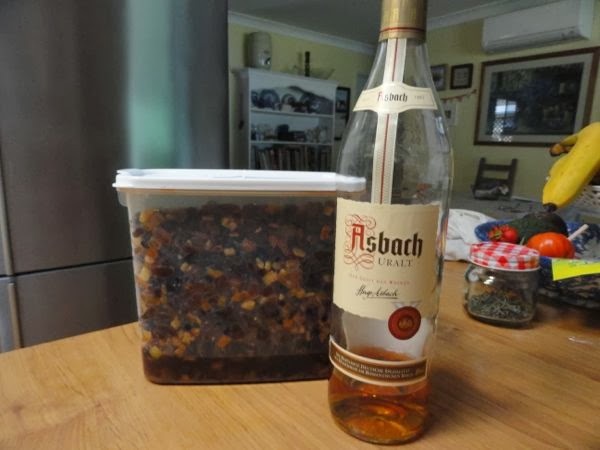 The fruit for the Christmas cake is soaking in good German brandy. I'll have to add more as I go along because the fruit is soaking it all up nicely. I'm still cruising along on the cardigan I'm knitting for Jonathan. I've finished the back and one front so I should have it done by Christmas. Fingers crossed. 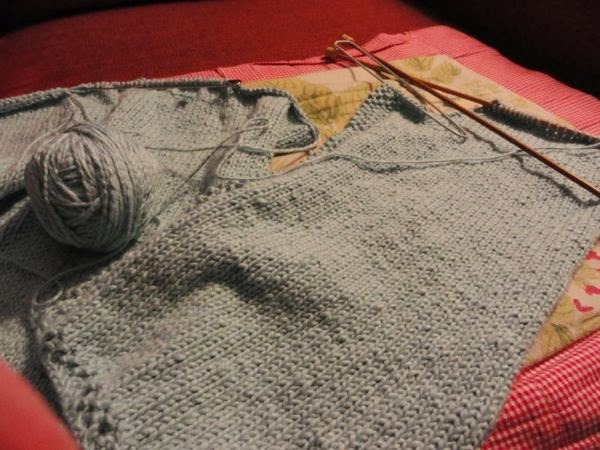 It's been slow because it's only a few rows at a time, but slow is good, I can work with that. Later this morning I'm going to the Maleny Dairies, where I'll take some photos and pick up some of their delicious milk and cream. Then on to Rosetta's, my local book store, to buy a book I want to give as a Christmas gift. After that, lunch with Patrick, then back home to Hanno who is still hobbling around on a swollen foot. Thank you for all the suggestions for treating gout. Unfortunately, Hanno is on Warfarin, so he has to be very careful with pills and potions, and even the vegetables he eats. We appreciate your thoughts though and Hanno asked me to thank you for thinking of him. What are you doing today or tonight? Are we all social butterflies today or are there some solitary bees staying at home with the honey? Like you I'm very much a solitary bee. I love my friends and families company when it's there but can go months or years without seeing them. But they all know what I'm like and don't badger me. And it's always lovely when we do finally meet up. My box of fruit is soaking on my daughter's counter top, just wondering if I should top it up with more brandy. I am like you Ronda.....I enjoy my own company and sometimes dislike intrusions. But, it does make me enjoy the company do others more when I feel inclined to do that. I have friends who, because of distance only keep in contact with every couple of months but we have been friends for many years. What am I doing today you ask.....well today is very exciting and something we have been waiting for ...for a long time. I am in Brisbane with DH and we are going to buy a new caravan in which we plan to live and travel forever. Enjoy your trip to Maleny....have been there once, it is a lovely part of the world and reminds me of the Atherton Tablelands where we used to live. Have also had gout and am on Warfarin myself so I feel for Hanno ....I know you will make sure that he rests his foot. Hope he gets better soon though....it is no fun. Today I finished getting my lawn and garden ready for winter. It is a good feeling to have all that outside work done. As I came inside-it began to rain-perfect timing. Now I can look ahead to the holiday season and all the joy that brings. Hope you have a wonderful visit with your friend. That sounds like a lovely day Rhonda. I always put off catching up with people socially, but then find that I really enjoy it when I make the effort. The best friends are those who understand you enjoy your solitude too. I`m also a solitary bee. I`m happy to be at home alone, too. Sometimes I even long for some time apart from DB, so that I can have some peace and tranquillity without the disturbance of a TV in the background. I love pottering around the house, doing my little jobs and projects on my own and then come together with DB for a cup of tea and a chat. My youngest son and his family visit occasionally. Then I cherish the time spend with them and my little granddaughter Alyssa Rose (now 7 month old). It`s lovely to see them when they visit, but I do like my solitary life, too. I'm a solitary person too. I've always been this way. It was hard for me when I was a child because my parents thought it was a big problem and I often felt forced to act differently. But as an adult, I feel fine about myself. I love to be at home with my husband and kids. I see friends when I feel like seeing them and that's always nice, but I don't feel the need to do it often. Work for this bee. Have a great lunch, it would be my dream to chat with a raw/vegan chef. I to enjoy my own company I think its more the younger generation that are social butterfly's. I am a social person, generally speaking, but that is only if I can have my "me time" as well. I get to the point where I just want to be by myself, either doing things or not, and reconnect with myself. Pottering, is what I call it. That sort of recharges me, and without it, I end up falling in a hole. The next few days we are heading back to Sydney to visit with friends we haven't seen for a while. It will be a full-on time of catching up, so I will definitely need some "me time" when we get back! I'm also a solitary bee it is good when you enjoy your own company. I have already made my xmas cake and just went out and brought some more Brandy for the xmas pud. I'm a solitary bee as well. I take after my Dad in that respect. My Mum used to worry that I prefered my own company to that of others, but I think she's accepted that she is never going to to get me or my Dad to be social butterflies! I think I am a mixture of social and solitary. I like being a part of something, which I get with the Master Gardening projects I do, but I love the days I am home alone with no errands to run or activities to take kids too! Just me and my work. I am a very solitary bee. I always have been and always will be. I have my family and a very close friend but the rest of my friends I only see once in awhile. I am content at home. I would be a solitary bee too if at all possible. I am most happy with a good book, a glass of tea, and a nice chair. However with grandchildren underfoot all day being alone is not going to happen. It is a joy though to share their life. I am sorry your husband has the gout. My dear cousin suffers with that and it is awful. Poor Jerry (my cousin) is almost a cripple with it. His kidneys are not doing great either because of his gout. I wish I could help him in someway but there is not much to do but let it pass. Jerry has super high blood pressure. He has had high blood pressure all his life. He follows the diet, takes medication, and really tries hard but the blood pressure issues just don't go away for him. Rhonda, just reading about Maleny makes me miss Caloundra as we always used to go there in December but since the flooding of the past two summers have been going in winter when the weather is calmer. I am sure you will have a lovely day. Hopefully Hanno will be fully recovered very soon. This was such a great post Rhonda. I love being alone and I thought I was just being shelfish. Now I know I am normal. I like to do my puttering as I call it. I have spent my life raising kids and taking care of people and working and now I believe is time for me. Thanks for making me feel normal. Love your blog. I find I'm more and more a solitary bee. I like being at home. I don't like the 'rat race', hitting the roads to shop, or too many social events. I do have friends that I enjoy seeing time and time again--but those visits are spread out for sure. I see my children and grandchildren on a regular basis, look forward to gathering with family for the Holidays...but on the whole. I just like being busy at home. These days...I've not been busy enough...it seems I've plenty to do around here. Dust has settled---and it needs clearing out. There is time for all that too I suppose. I guess you can say, I'm a solitary "busy" bee. take care, hope your visit to town and with friends is a pleasant one. I know the feeling... I'm a solitary kinda gal too. I wasn't always. I used to be a social butterfly. I guess that's something I need to reflect on. I'm a content at home person too. I relish a day at home on my own. As another little bee (my name even means bee!) I really enjoy having time to myself and working at home and in the garden. I do like to be social too, but on balance there is more me time than us time. There's an interesting talk by Susan Cain on TED talks called The Power of Introverts that is worth a listen on what we quieter ones have to offer. Today I have been making my first Christmas cake. It reminds me so much of my grandmother and mother getting ready for Christmas when I was young. We all had to take a turn at stirring the Christmas pud and make a wish for the new year. The house is now full of those lovely Christmas spicy baking smells and my mind is full of lovely memories. Thanks Mum. Oh I'm definitely a solitary bee! I do the social butterfly thing when I need to, and love catching up with family and close friends, but then come home to my haven and settle into normalness again. I'm definitely a loner too, I wonder if there is a connection between loving homemaking and the simple life, and being that sort of person? Maybe, there seem to be a lot of us solitary bees here. thank you for your wonderful blog, rhonda. it reminds me of the grass roots magazines that inspired my mother to live a partially self sufficient lifestyle back in the 80's. i'm a solitary bee that felt less-than for not being a social butterfly in my early years. living on an isolated cattle property in the channel country gave me a love of a simple life. close to nature and animals, but connected to distant friends through letters and phone calls. living in the big smoke is difficult for me sometimes, with the crowds of strangers and the pavement and pollution, but my social butterfly side has had a chance to spread her wings. as long as i have time to retreat into my own space in between, i am enjoying the opportunity to make new friends...and to catch up with my inspiring family on the coast. my friends here, i think, are also bees in their own ways. your christmas pudding preparation photos remind me that i will be making one with my aunt again this year. a lovely way to keep family recipes and traditions alive. time soon for me to collect materials to start making a few gifts. this year i will be designing and making personalised embroidered pictures, perhaps on fabric covered hoops. I'm more-less like you, i understand you so well. I love this entry, maybe i love all your post, well...i love your blog! Your comments about soaking the fruit for the Christmas cake jog my memory that an old friend passed onto me. You may like to try it and I am sure you will be pleasantly surprised. Mix all ingredients together and place into a lined baking tin, and bake for 1 hour. I would starting checking on it around 50 minutes, by sticking a skewer in if comes out clean then it is cooked. Thanks for sharing, Michael, but I'm not a big fan of easy food. I prefer slow and traditional when it comes to Christmas cakes. Thank you for your insight about being a solitary bee. I think I am one as well. I enjoy being in the company of others, but really cherish my time alone to walk, enjoy nature, swim, be at home and work on my crafting. Solitary today! Frantically making stuff for a craft fair a week on Sunday....in the hope of making some money to pay off bills etc. I've got my second Christmas cake resting on the table, I'll brush it in brandy before it goes away for Christmas. I'm a solitary bee too. Happy to spend all my time with my husband, and potter around our house and garden. Too many people make my head spin. Warfarin can be difficult! My mother's on heparin, but I am working on a project at work on atrial fibrillation so have some understanding of how much warfarin impacts on your daily life. Hopefully it does the trick and he doesn't have to stay on it for long. I'm like you, Rhonda - definitely a solitary bee (bee? I thought bees were one of the most social insects around, but I digress :o)). I do enjoy the company of my family, but I'm terrible at catching up with people I don't see every day. I really, really enjoy the quiet and solitude. Always have. I do sometimes like to be at gatherings, but I'm almost always mostly a spectator, and once the action's over I'm happy to be back home. I'm not sure about Israel, Anna, but here in Australia, we have social bees and we have many native solitary bees. My favourite of them being the Teddy Bear Bee. Today is extra happy as we are moving back to work for our old employer whom we were with for 5 years. We moved to the job we have now only 5 months ago and it did not work out and 3 weeks ago our old employer had a job come up on the farm next door ( that dh will manage by himself) to where we lived before and did we want to come "home" Did we ever :-) All the fruit trees are packed on the tandem trailer and we will need another trailer for the rest of my plants :-) While here I felt oppressed in my gardening and where we are moving to I have the run of the place to do as I please. We can stay there for many years and we will be. We originally left working for them because I needed a break from milking cows. The new job is 190 cows and the wages are going up by a massive $22,000 a year from what we are being paid here on this job. Like you Rhonda I am known amongst my friends for being a bit of a recluse and they accept that and we have fabulous times together when we all meet up. They are busy with their work, gardening and families so we all gel together with likemindness. This morning I brought 3 bantam hens . I had to get rid of my chickens to a friend when we moved here and now I can have a little flock again :-) I can not wait to get my Christmas cake started and a new ginger beer plant and then it is onto making the wedding cake for our daughters wedding in January, making decorations for the reception venue and organizing the flowers. Such joy. My cup runneth over. Just back from Indianapolis (the capital about 60 miles north of here). My husband is on a panel of professors from the local university and he gave a short talk as part of the program concerning his forecast for the U.S. economy for next year. We went up yesterday afternoon and stayed in a nice hotel and had a wonderful italian dinner last night. It's nice to get out of this small town but I am definitely a solitary bee and a homebody to the bone (some would say a stick-in-the-mud) but someone needs to stay home and keep the home fires burning. I love being home doing my own little stuff. I am a bee too. I like getting together with others and sharing meaningful and memorable times with them, but I am usually not the one who is organising the party. I also find small talk somewhat draining, so I am happy at home and developing strong relationships with those I know well. Today I am finishing up some of my blog posts and doing some household chores. That is during the nap times of my little one. When she is up, it is time to focus on her. Have a lovely visit with your friend! I don't know if I am a bee or a butterfly. Maybe a little of both. 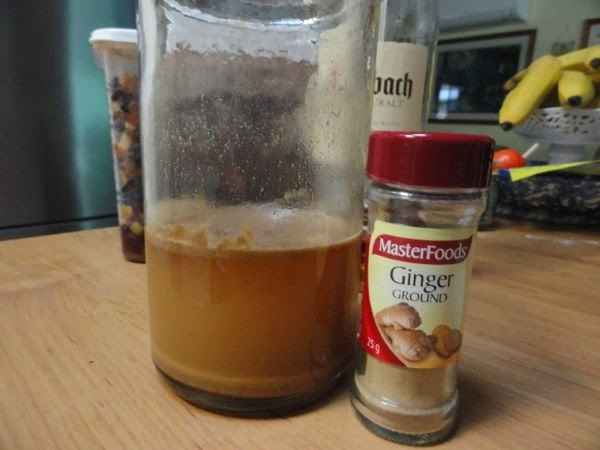 I've been meaning to try my hand at ginger beer. I copied down your recipe (after a little search for it) and think I shall. Matt's been experimenting with sourdough fermentation the last couple months....now we can both have a fermenting project!